Japanese World War II Map of Hawaii. 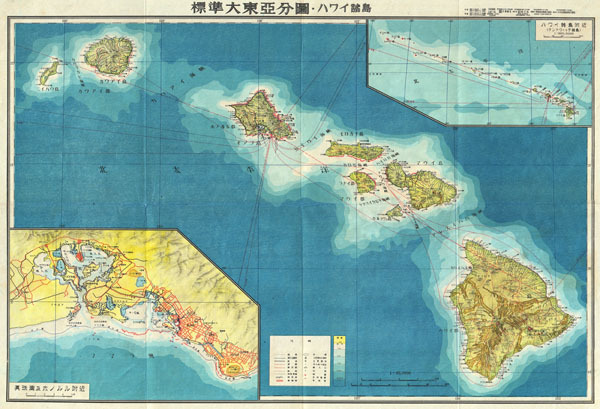 One of the most beautiful maps of the Hawaiian Islands ever produced; this is a stunning large format Japanese map of Hawaiian Island group dating to World War II. The map overs the entireties of the Hawaiian Islands with a large inset city plan of Honolulu in the lower left quadrant. Another inset in the upper right quadrant shows the Hawaiian Islands relative to other Pacific Islands in the greater vicinity. Offers superb detail regarding both topographical and political elements. Notes cities, roads, trade routes on air, sea and land, and uses shading to display oceanic depths. Scale of 1:85,000. All text in Japanese. This map was created as part of a 20 piece series of folding maps of parts of Asia and the Pacific prepared by the Japanese during World War II. This map is no. 18 in that series. Very good condition. Original folds. Comes with original folder.